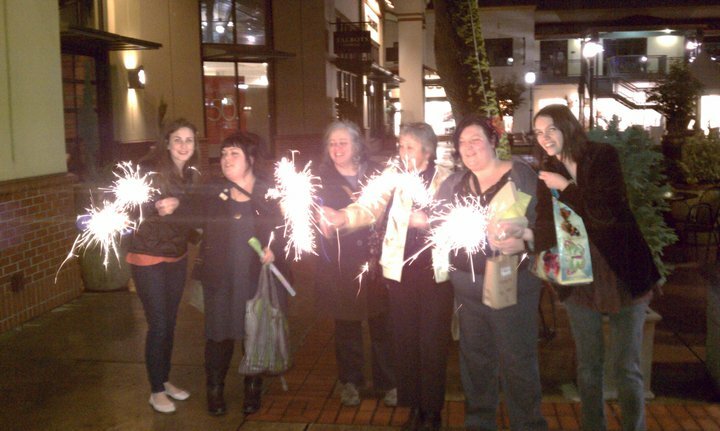 I wanted to show you this photo from our really fun holiday party - which we have in January. Believe me, if you are in retail, you understand why we celebrate so late. And celebrate we did....good food, good cheer, and some sparklers too. And, per usual, the gift giving was bountiful. Tara gave us each a word..How cool is that? We each got a word ..My word was visionary. And there were lots of other good words too. Plus Alison gave me a meyer lemon she brought back from her uncle's tree in California and there was art from Becky (more on that later), bath treasures from Lindsey, some supercute packaging and other treats.....I love coming home from a party with treasures.